“Strong and strident women” is the memory that Carolyn Puccio has of her years at St. Anthony High School Now a leader in the Sisters of St. Joseph Carondelet community, she is a proud graduate of St. Anthony which decades until it was closed in 1971. At that time nearby DeLaSalle, operated by the Christian Brothers, became a co-ed high school. Unlike most of the Catholic high schools in the area St. Anthony High School was operated by the parish itself. The original building still stands at 8th Street and 2nd Avenue Northeast where it houses one of the Catholic Eldercare sites. St Anthony High School was actually co-educational until DeLaSalle opened in 1900. St. Anthony’s High School grew out of the parish of St. Anthony of Padua which was established in 1849. In 1853 the Sisters of St. Joseph opened the school, which was known for a time as St. Mary’s Convent. The name change came when the school was merged with the parish school across the street some years later. The new facility which provided a home for the first church, the convent that housed the first parochial teachers in Minneapolis, continued to be known as St. Mary’s for many years. Though tuition was just fifty cents a month several of the young scholars were admitted free. Receipts for 1854 were $197.58, with expenses at $203.70, leaving a deficit to begin the school year in 1855. In his book Lighting New Fires, published by the National Catholic Educational Association, historian Michael Guera notes that “this item of information is of interest only to show how poorly and simply our predecessors lived, their wants were few and even those were supplied with difficulty; their spirit of self-sacrifice was great and their contentment in making sacrifices was still greater. The first school had just five school rooms and a residence for the Sisters on the second floor. Sister Gregory LeMay, one of the original teachers, was the first Sister to receive the habit of the Sisters of St. Joseph in St. Paul. For most of its history St. Anthony was staffed almost entirely by the Sisters of St. Joseph. 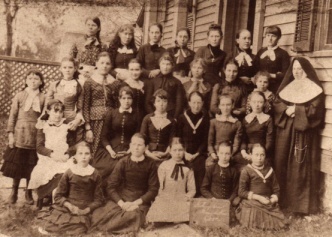 St. Anthony, unlike most other high schools of the Sisters of St. Joseph, remained a parish-owned school. Although the three year diploma offered at the high school for many years did not qualify students for college entrance, many students were admitted by taking entrance exams. At that time it was uncommon for young people to go to college, but most of the St. Anthony graduates did. In 1915 the building for St. Anthony’s High School was opened. For decades it educated the young Catholic women of Northeast. Graduates of St. Anthony of Padua High School have happy and amusing stories of their experience. They agree that attendance at the school was “always a special advantage to families in the area.” Graduates of St. Anthony of Padua elementary school were assured of admission to the high school. They tell stories of threadbare blue jumpers and blue oxfords commonly known as Happy Hikers, of playing basketball – and “usually losing” – against other Catholic girls’ schools in the Twin Cities, of dramatic productions in which boys from DeLaSalle were recruited to play the male roles. 1954 graduate Rose Vennewitz, now living in Fridley, remembers the experience of being checked out by the Sisters before going to the Prom. One common memory is of the May processions to the Shrine of Our Lady of Perpetual Help, constructed in 1947 and still a on the grounds of St. Anthony of Padua church. Though the school is closed the spirit remains as countless graduates of St. Anthony continue to lead the Northeast community. The journal is not available online, but anyone interested in obtaining a back issue of Hennepin History may contact the Hennepin Museum directly at museum.info@hennepinhistory.org or find the original Fall 1998 issue of the journal at the library. It’s a great and unique reflection of an historic community – which really does have a church on nearly every corner. You might want to follow up with a walking tour – or follow the fabulous bazaars and other events these churches sponsor on a regular basis.